HomeGlobal Water Pathogen ProjectPART FIVE. CASE STUDIESApplication of the risk-based framework - is it safe? 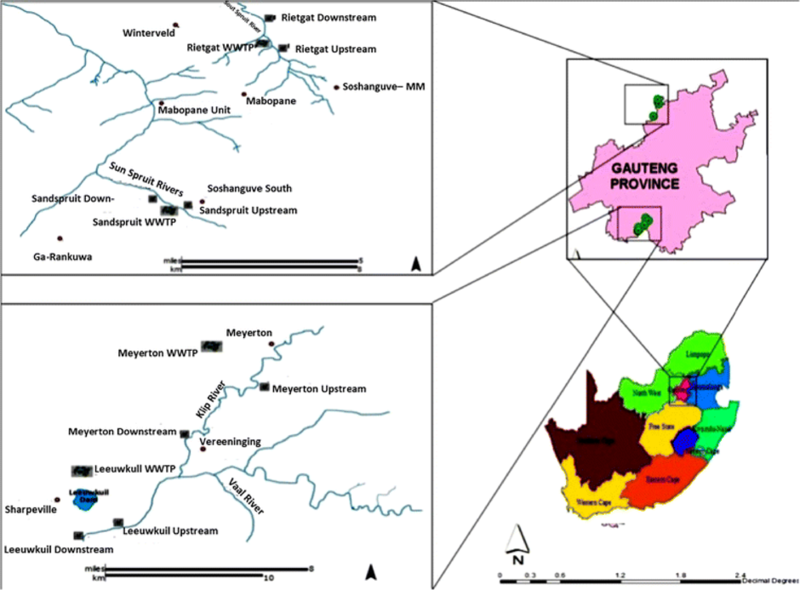 This case study reports the health risks faced by communities relying on untreated surface water contaminated by enteric bacterial pathogens for domestic, recreational and agricultural purposes in developing countries such as South Africa. Unless people have access to basic services such as safe drinking water and improved sanitation infrastructures, efforts to prevent death due to waterborne pathogens are doomed to fail. The study involved two wastewater treatment plants (WWTPs) in Sedibeng District, Gauteng South; and another two WWTPs located in the Soshanguve peri-urban area of Tshwane Local Municipality, Gauteng North, in South Africa. The Leeuwkuil WWTP and the Meyerton WWTP (both in Sedibeng District) were assessed because they are frequently hydraulically overloaded during the wet season, though their operational capacities remain manageable during the dry weather. It is believed that their operational inefficiencies pose pollution problems to receiving water bodies. The Rietgat and Sandspruit WWTPs serve the Soshanguve peri-urban area of the Tshwane Metropolitan Municipality and discharge their effluents into Sout Spruit River and Sun Spruit Rivers, respectively. These WWTPs were assessed because they have been showing an increasing risk trend when measured against the wastewater treatment works risk-rating criteria set by the Department of Water Affairs, South Africa. Sedibeng District is situated on the banks of the Vaal River and the Vaal Dam and has a population of 805 168. Of this, Meyerton and Leeuwkuil WWTPs serve approximately 83.13% and 23.5% of the households respectively. The Soshanguve peri-urban area has a population of 664 900, which is served by Rietgat and Sandspruit WWTPs, both of which have a design capacity of 20 Mℓ/day. Currently, the water and sanitation backlog of the City of Tshwane Municipality comprises 69 987 households and Soshanguve contributes 13.93%. Based on the occurrence of bacterial pathogens in these water sources, and the volumes of raw water that can be ingested intentionally or accidentally, the daily combined risk of infection from S. typhimurium, S. dysenteriae and V. cholerae indicated that individuals who rely on these water sources for their daily needs run the risk of contracting S. typhimurium, S. dysenteriae and V. cholerae infection after a single exposure. Quantitative microbial risk assessment (QMRA) provided a better assessment of water safety than the absence/presence of faecal indicators. It also helped to better understand the risks associated with different categories of water use, even if that water is from the same source. Additional Treatment. The WWTPs hydraulic performance could be improved by upgrading their treatment capacity. Also, for domestic purposes, people could alternative treatment options like chlorine tablets and/or boiling in order to remove pathogens. Restrictive Measures. Contact recreational activities in river pools should not be allowed until there is an improvement in the treatment efficiency of the WWTPs discharging into those rivers.